London, UK, 2 October 2018 – There is considerable unease among global shippers/BCOs (Beneficial Cargo Owners) and freight forwarders ahead of the IMO’s 2020 global emissions regulations, due to come into force on 1 January 2020, according to a survey conducted by global shipping consultancy Drewry. Particular uncertainty and concern was expressed by respondents in both the survey and follow-up interviews about carriers’ methods of fuel cost recovery with more than half of all respondents (56%) stating that they did not consider their service providers’ existing approaches as either fair or transparent. Further to this, 4 in every 5 of the shippers/BCOs participating in the survey stated that they had yet to receive clarity from their providers as to how the widely anticipated future fuel cost increases, set to accompany the 2020 regulatory change, would be met. Despite the significance of the change and the high press and media profile given to the subject in recent months, a surprisingly large proportion (33%) of respondents to the Drewry survey admitted to having poor or very poor awareness and understanding of the new regulation. In Drewry’s view, the level of uncertainty today as to the total cost impact is so large that nobody is able to provide a confident forecast of the cost of compliance; the only certainty is that the extra cost will run into billions of dollars globally come 2020. 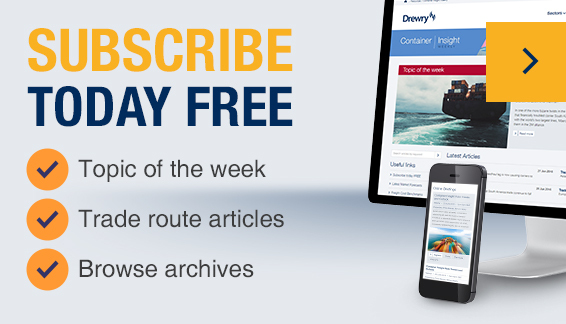 Based on independent “futures” prices, low-sulphur marine fuel prices per tonne will be 55% higher than current high-sulphur fuels and Drewry considers that the probable “worst case” scenario is that fuel costs (paid by carriers) and fuel surcharges (paid by shippers) in global container shipping will increase by 55-60% in January 2020. 106 survey responses. 15 follow-up (30 min) interviews with shippers/BCOs. 62% shippers and 38% freight forwarders. 67% of shippers moving >10,000 TEU per annum. A surprisingly large proportion (33%) of respondents expressed poor awareness and understanding of the new regulation. 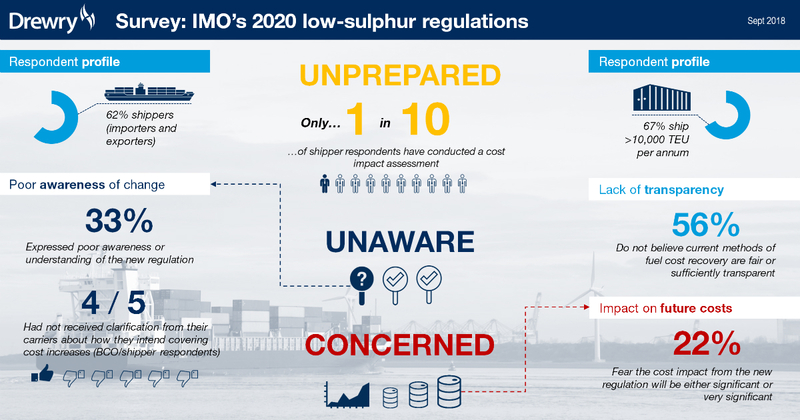 More than half of all respondents (52%) feel either ‘not prepared’ or ‘not at all prepared’ for the impact of the new IMO emissions regulations. 76% of respondents had not received clarification or information from their provider as to how they intend covering potential cost increases from the regulation. 4 in every 5 of the shipper/BCO respondents had not received such clarity from their providers.